Meet the spectacular cosplayers of New York's annual Comic Con. 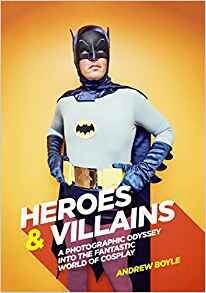 Heroes & Villains is a photographic journey into the heart of contemporary pop culture that is New York's annual Comic Con. Photographer Andrew Boyle captures more than 200 cosplayers from NYCC in a series of stunning photographs and interviews, celebrating the incredible world of expression, talent, inclusivity, creativity and fandom that is the cosplay community.